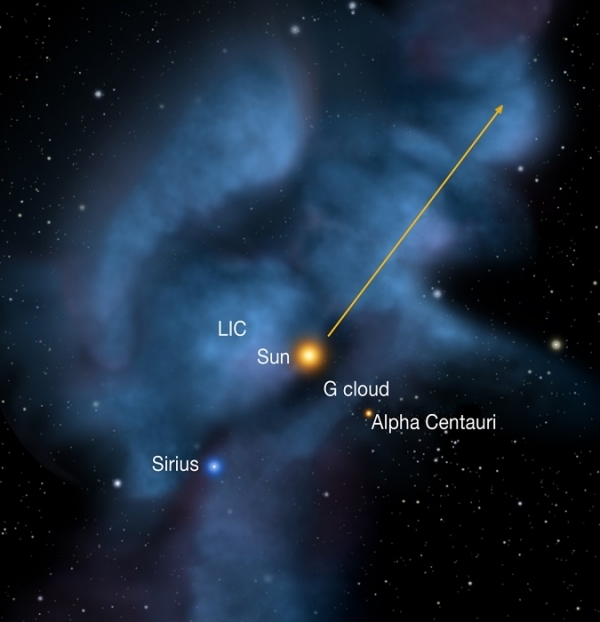 Interstellar Winds Buffeting Solar System Have Shifted Direction. From Nature World News: New data show that the particles streaming into the solar system from interstellar space seem to have changed direction over the last 40 years. Scientists were first alerted to a possible change through measurements taken by NASA’s Interstellar Boundary Explorer (IBEX) mission. The readings, according to the study published in the journal Science, differed from those derived by the Ulysses spacecraft during the 1990s. Seeing this, the IBEX team compared IBEX’s measurements to data gathered by 11 spacecraft between 1972 and 2011, thereby ruling out the possibility that the newer instruments were simply providing more accurate results. Ultracold Big Bang Experiment Successfully Simulates Evolution of Early Universe. From Science Daily: Physicists have reproduced a pattern resembling the cosmic microwave background radiation in a laboratory simulation of the big bang, using ultracold cesium atoms in a vacuum chamber at the University of Chicago. “This is the first time an experiment like this has simulated the evolution of structure in the early universe,” said Cheng Chin, professor in physics. Chin and his associates reported their feat in the Aug. 1 edition of Science Express, and it will appear soon in the print edition of Science. It’s Official: Voyager 1 Leaves the Solar System. From Space.com. After months of speculation, NASA announced yesterday that NASA’s Voyager 1 spacecraft left the solar system in August 2012, popping free into interstellar space after 35 years of spaceflight. Voyager 1 and its twin, Voyager 2, launched a few weeks apart in 1977 to conduct an unprecedented “grand tour” of Jupiter, Saturn, Uranus and Neptune. The duo wrapped up this mission in 1989, then kept on flying toward interstellar space. Voyager 1 departed the heliosphere— the huge bubble of charged particles and magnetic fields that the sun puffs out around itself — on or around Aug. 25, 2012, researchers say, becoming humanity’s first envoy to the vast realm beyond the solar system. Researchers a Step Closer to Finding Cosmic Ray Origins. From Science Daily: The origin of cosmic rays in the universe has confounded scientists for decades. But a study by researchers using data from the IceCube Neutrino Observatory at the South Pole reveals new information that may help unravel the longstanding mystery of exactly how and where these “rays” (they are actually high-energy particles) are produced. When Did Human Speech Evolve? From NPR’s 13.7: Human speech evolved approximately 1.75 million years ago, our human ancestors achieved a technological breakthrough. They began to craft stone hand axes (called Acheulean tools) in ways that required more planning and precision than had been used in earlier tool-making processes. Around the same time, these prehistoric people began to talk. In other words, tool-making skills and language skills evolved together; our language, as well as our technology, has a long prehistory. Water Hidden in Moon May Have Proto-Earth Origin. From Phys.org: Water found in ancient Moon rocks might have actually originated from the proto-Earth and even survived the Moon-forming event. Latest research into the amount of water within lunar rocks returned during the Apollo missions is being presented by Jessica Barnes at the European Planetary Science Congress in London on Monday 9th September. The Moon, including its interior, is believed to be much wetter than was envisaged during the Apollo era. Meteorite Brought Surprising Ingredient for Life to Earth in 2012. From Space.com: Scientists have discovered unexpected ingredients for life — organic molecules never seen before in meteorites — inside a chunk of space rock that fell to Earth over California last year, scientists say. The discovery comes from an analysis of the so-called Sutter’s Mill meteorite, which lit up the California night sky with a dazzling fireball in April 2012. Meteorite fragments from the event may shed light on the primordial ooze that helped give rise to life on Earth, researchers said. This entry was posted in Uncategorized and tagged Big Bang, cosmic rays, cosmology, evolution, hominoid, Ice Cube project, language, Mars, meteorite, Moon, NASA, proto-earth, solar system, South Pole, speech, Voyager 1, Voyager 2, water. Bookmark the permalink. Do you have any expectations for what you’re going to see? Or will you be looking with brand-new eyes? Stone: I think we’ll be looking with brand-new eyes, because if there’s one thing that Voyager has taught us, it’s the most important thing we will learn is that which we didn’t know we would learn. So we are constantly looking for things that we hadn’t expected to see. I agree the Voyager story is amazing. I love astronomy as well and am also a huge science fiction fan. I agree that this is a monumental step for humanity with our first vehicle reaching interstellar space.